A double-decker train will soon run on the Konkan Railway route between Mumbai and Goa. The commissioner of railway safety (CRS) agreed to grant clearance if the train is run as a holiday special to coincide with the Ganesh festival. CR plans to run the service on alternate days as only one rake is available, with Janshatabdi-type coaches. 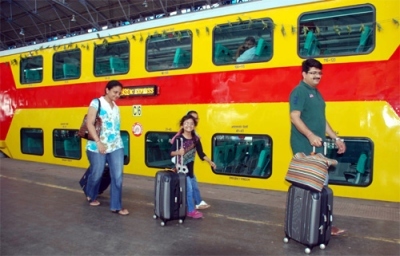 CRS (central circle) Chetan Bakshi said that Konkan Railway and Central Railway will have to seek fresh approval when they plan to run the double-decker train as a regular service. A meeting was held between senior CR, KR and CRS officials to ensure the train runs before the festival. A railway official said, "We have not got formal approval from the CRS. But he has asked for the submission of an application with modifications as suggested by him. He agreed to give the approval if the train is run as a holiday special." The train is expected to depart from LTT at 5am and reach Karmali around 4.30pm. From there, it will depart at 6am the next day and reach LTT at 5.50pm. But the final date and timings are yet to be decided. Ten coaches may be attached to the double-decker train.